When you're picking up your holiday supplies over the coming weeks you will probably notice something different sitting on the sunscreen shelves. These new sunscreens, with a sun protection factor (SPF) of 50+ (SPF50+), certainly sound as though they'll offer a lot more protection than those which have been available until now. But experts warn we shouldn't become careless about sun safety when using them. "The way we should approach this is to say, 'I'll still limit my time in the sun, but when I am in the sun I have that little bit extra protection'," says Professor Michael Kimlin, head of the National Health and Medical Research Council's (NHMRC) Centre for Research Excellence in Sun and Health. "The amount of change between (SPF)30+ and 50+ is small, and people need to be aware that sunscreen is always the last line of defence." Honorary secretary of the Australasian College of Dermatologists Dr Philip Artemi agrees, saying wide-brimmed hats, sunglasses and appropriate clothing, seeking shade and staying out of the sun in the middle of the day is just as important as ever. The sun protection factor (SPF) of a sunscreen refers to the length of time it takes for skin to burn after you have applied sunscreen. It also refers to how much light it stops from reaching the skin. "If you normally burn in five minutes (without sunscreen), with SPF30+ you have 150 minutes of grace; with SPF50+ you have 250 minutes," says Artemi. SPF50+ sunscreens block 98 per cent of UVB rays – compared to 96.7 per cent in SPF30+ sunscreens. 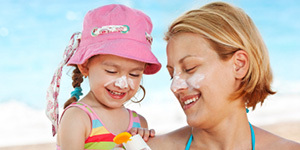 The broad spectrum component of sunscreens protects you from UVA rays. Kimlin explains while UVB rays make up a very small percentage of total UV rays, they are more aggressive and cause the DNA damage that can lead to skin cancer. UVA rays are less energetic, but break down collagen in the skin, causing premature wrinkling and aging. the SPF rating is only reached when the sunscreen is applied correctly. Australian research shows most of us need to double the amount of sunscreen we wear to actually get the SPF written on the bottle. When you are choosing sunscreen, make sure you like how it feels on your skin when you put it on. "UK research shows that people use sunscreen based on how it feels on their skin, so once they find something they like they'll use it," says Kimlin. Once you have a product that suits you, there are a number of steps to follow to ensure you get the best protection from it. back of the neck and ears. The SunSmart website has a calculator to help you figure out exactly how much sunscreen you need to apply. Let it soak in: It takes 15-20 minutes for sunscreens to get into the top layer of the skin, so the longer you wait before going into the sun the better the protection. When this isn't possible or practical, still apply your sunscreen because some is better than none. Use the right sunscreen: Many cosmetics have sunscreen in them, but if you are going out into the sun you should still apply a high SPF product underneath. The Cancer Council Australia recommends: "Foundations and moisturisers that contain sunscreen are fine if you are outside for short periods such as a quick trip to the shops at lunchtime. However, if you need to spend periods of time in the sun, use a separate sunscreen and reapply it every two hours." If you are exercising, sweating or swimming, consider a sports sunscreen that is thicker and less likely to wash off. Remember to recoat: Manufacturers test their sunscreens under ideal conditions, so it's important to factor in what you are doing when you are in the sun. For example, if you're sweating, swimming and/or wiping yourself with a towel, you should recoat sooner than what the directions on the bottle say. And as Artemi says, we all miss bits occasionally, so applying two coats is better than one. "I prefer that second application not to wait for two hours. I like it to be after an hour, because that's a nice safety margin to take in sweating, wiping it off, etc." The good news for people with concerns about their skin or the chemicals in sunscreen is that there are many alternative products and ways to protect your skin. "Really, there is no excuse not to protect your skin from the sun," says Artemi. Sensitive skin: if you have sensitive skin or conditions such as rosacea or eczema, chemical-free sunscreens or those containing titanium dioxide or zinc oxide are less likely to cause problems. Look for products that are PABA-free. Babies and toddlers: Cancer Council Australia recommends babies under 12 months not be exposed to the sun because their skin is thin and can easily burn.Cover them with clothing and hats, and provide shade. If it is unavoidable that parts of their body (i.e. hands) are in the sun, a high SPF sunscreen is suitable for babies of all ages, according to the Australasian College of Dermatologists. Chemical concerns: There is debate about the safety of nanoparticles in sunscreens being absorbed into the skin, but the TGA points out that evidence shows these particles remain on the skin and don't cause any harm.If you are concerned you can use chemical-free sunscreens and follow all the other guidelines of sun protection – covering up, seeking shade, avoiding the sun in the middle of the day – to look after your skin. High SPF sunscreens are important in Australia, where melanoma is the third most common cancer and where two in three people will be diagnosed with skin cancer by age 70. Ninety-five per cent of melanomas are caused by sunburn, so you still need to slip on a shirt and slap on a hat – even when you're slopping on SPF50+ sunscreen. "The rules have not changed. SPF50+ is not an opportunity for people to increase their exposure," explains Kimlin. "The best way to use sunscreen is in combination with other strategies: sun minimisation, utilisation of shade and appropriate clothing."